I play guitar for about 2 years and only last time I started feel strong pain in thumb joint when playing barre chords. I never had it before. As I play a little (15-20 min) it stars to hurt bitterly. I had exactly the same problem a couple of years ago. I hadn't changed my technique or hand position and for some reason, out of the blue, my thumb started hurting after short periods of playing barre chords. I gritted my teeth, played through it and the pain soon went away. I also had a similar problem with my index finger. Again, I played through it and the pain went away after a couple of months. Most recently I was getting frequent pain in my wrist after playing for over an hour. Only in the past week have I noticed it subsiding. Now, I might have just been lucky in all these cases and I could have made the pain ten times worse by ignoring it. So I wouldn't advise the "gritted teeth" method. But on the other hand, I know guitarists who have been playing for decades and these apparently random phases of pain are quite normal and usually associated with minor changes in your playing technique or the focus of your practice sessions. It's only when the pain gets worse, or physically stops you from playing that you ought to consider seeing your doctor as it could be RSI related. 1) Has my hand position, action or technique changed recently? 2) Am I applying more pressure than is actually necessary to grip the chords? 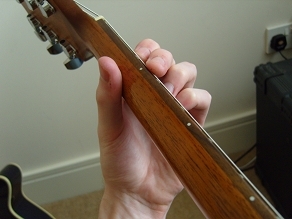 It could be that you're gripping the chords tensely, putting more strain on your thumb joint. Try to relax and apply as little pressure as possible. 3) Am I using some effective finger stretching exercises before I play? 4) Have I learned any new techniques recently that may be putting more strain on my fingers or am I using a certain technique more than before? Some techniques are more intensive than others. Barre chords naturally require more strength than open chords, so if you've started using them more then your fingers might just be adjusting. Pain is, unfortunately, a necessary part of a guitarist's progress. 5) Does the pain subside shortly after putting the guitar down or does it linger for days after? If you can play for 15 minutes, put the guitar down and be able to pick it up again in another 15, then I would just keep having those breaks and see if you can gradually play for longer and longer periods without pain until it goes away. If the pain stays with you for over an hour after putting the guitar down, then it may be more serious and I would first try a week or even 2 week break from guitar all together (I know, this is not easy if you really enjoy playing!). If after that break you play the guitar and the pain hits you again after 15 minutes, it's time to see the doc. Keep in touch with your progress using the comments form below. If anyone here has experienced pain in their fingers, please let us know how you dealt with it using the comments link below. Cheers. I have thumb pain when playing acoustic barre chords pieces: the time when the most pressure is needed. The pain is, I think, in some muscle or tendon at the base of my thumb. It doesn't hurt when I'm not playing, but if I start that sort of playing again it quickly returns. 2 weeks away from the guitar (completely) did not help. I had something very similar but, strangely, it went away after about 6 months. When I think about it, most of my playing before this was less "barre chord intensive" so when I happened to write a few songs that made more use of barre chords, it was like my fingers had to get used to the extra pressure. It was probably more of a sudden change than I realised at the time. get volume without pressing hard! This information is most helpfull. you may try a search on basal joint problems then go get an xray to make sure you don't damage the area further. If this is your problem and I hope that it is not see the doc. I've been playing now for many moons and I've got to have basal joint reconstruction. It is a common procedure, takes a while to heal, and many report outstanding results. I have not had it done yet myself but I'm getting closer. I had the same problem today. I was playing the bar chord Am ( 5th fret style) with my band, and it hurt so bad the it felt like I couldn't play another second, and now it still hurts. when I started playing barre chords I wasn't able to make them sound good & was only able to play for 5mins at max. Gripping those barre chords was by itself a hell lotta difficult & painfull since I got very very small hands. I applied this technique. I used to continously press just the barre with my index for as long as I can. I started with 2mins & gradually over time I was able to press Index barre for 1/2 an Hour. It was really painfull & boring affair. I just used to sit infront of TV with gritted teeth & Index finger pressed in barre (no other finger was used). Eventually I was able to play those damned barre chords for longer time without any pain!!! I also developed water filled boils in my PINKY when I started hammer-on & pull-off exercises emphasing PINKY strength & durability. 1st time within 7 days of starting this kind of exercises. Even touching any string with PINKY was painfull. I had PINKY break for 3-4days & played only with Index, middle & ring finger!!! After 4months I overworked my PINKY with hammer-on, pull-off & chromatic exercises emphasing PINKY workout. I took full 2days break from playing guitar (Its really difficult to be part off from guitar, my love & passion!!!). I then realised the value of doing finger stretching, warmups & taking proper breaks. Thanks you Mike for teaching me the wonderfull Finger stretching technique. Your lessons are awsome & invaluable. I am from India & my local teachers lacks proper knowledge. So I am seeking online help. You are my savior bearing light to my darkness filled guitar journey. I am hoping to be a good soloist with your lessons & blessings.